White balance is one of those seemingly hard-to-understand, however, for most practical purposes extremely simple photographic concepts. The only reason why it’s difficult to grasp at first is because we seldom perceive it. And phenomena that we are not normally aware of can be a bit confusing. So, let me simplify it for you. Our brains have evolved in such a way that we would perceive colours most of the time as constant. Life is such so much simpler if a white piece of paper always seems to be white and your friend’s skin colour appears the same irrespective of you sitting at a table in the sun or at night illuminated only by candles. But the truth is that the white paper is not ‘objectively’ white and your friend’s skin colour changes! If you think about it, the reason is obvious. The colour of objects depends on the colour of the light that illuminates them. (After all, it’s hardly surprising that white paper looks blue if it’s illuminated by blue light.) And believe it or not: various light sources that appear white to our eyes (and brains) are actually coloured. Sunlight, e.g. contains relatively more blue light than red. Candlelight, on the other hand, contains more red light than blue. The reason why you’d say that your friend’s skin colour is the same in the sun and during the candle-lit dinner is because your brain fools you: it adjusts your internal ‘white balance’ without informing you about it. Your camera, however, doesn’t have a brain: you need to set it’s white balance. You have to tell it what your light source is like. Is it the sun? Is it a cloudy sky? Is it a fluorescent tube? Is it a traditional light bulb? Is it a candle? What you are telling your camera is what kind of light it should expect. Is it a light source that contains more blue than red? Or is it one that contains more red than blue? It is only thanks to this setting that the camera can then ‘perceive’ the white paper or skin tone correctly. For still photographers, life is simple. White balance is one of those very few settings that can be left on automatic! Yes, it is the Auto or the AWB setting. Your camera will do an excellent job of analysing the dominant light source (it basically ‘looks’ at the amount of blue and red and balances these two channels). More importantly: if you shoot RAW, white balance is metadata, i.e. you can adjust it later if you need to in post without any loss of quality. Of course, if you want to or need to, you can pick the dominant light source and use the corresponding white balance preset of your camera. 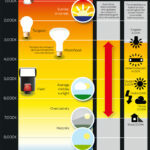 Pick the ‘Sun’ in daylight, ‘Cloudy’ on an overcast day and the ‘Lightbulb’ for traditional halogen lights. If you are shooting video, you cannot leave your white balance on automatic. Never. Ever. The colour of the light(s) illuminating your scene may change during your shot. The sun may be covered by clouds. You might move from a daylight exterior into an interior lit by artificial light source. Your white balance cannot change during your shot! So you have to set your white balance manually based on your light sources (or creative intentions). There’s lots of creativity hidden in choosing your white balance setting. If you want to get things ‘right’, go for your neutral settings. But if you want to achieve a different atmosphere you can select the ‘wrong’ colour temperature and make your image either colder (blueish) or warmer (yellowish-reddish). Colour temperature is measured in Kelvins and refers to the colour spectrum emitted by an ideal black body that is heated to that exact temperature. The amount of blue and red light in the black body’s spectrum depends on how hot it is. Think about a piece of iron, e.g. a horseshoe. Not an ideal black body, but quite black and definitely a body. Start heating it. First it will glow deep red. Then orange. And if you keep on heating it, once the temperatures get really extremely hot, it will be bluish, cold white. That’s it. Blue light has more energy than red light. 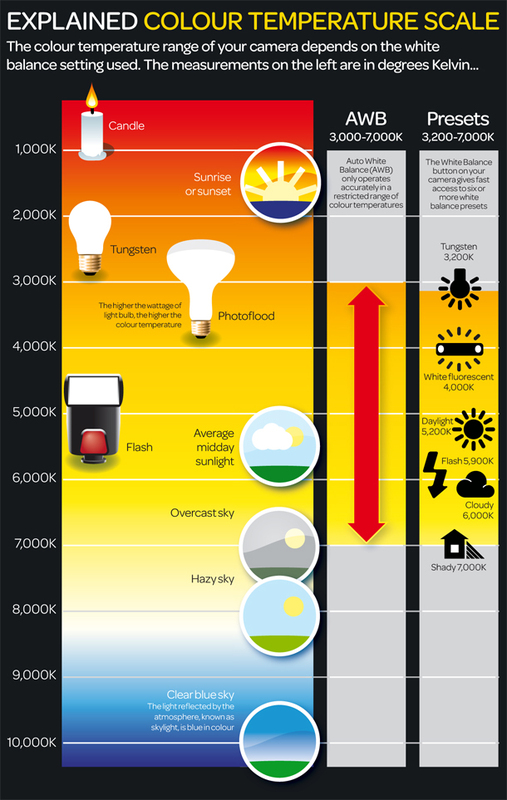 As objects get physically hotter, the emit relatively more blue light than red. Just try and not confuse physical heat with our psychological description of colours, the way we call bluish light ‘cold’ and red light ‘warm’. The sun is hot, thus its light contains more blue than red. A candle is a lot less hot, thus it emits more red than blue. On many cameras you can set your white balance in Kelvins. Just remember: the higher the Kelvin value (the hotter the ‘black body’), the more blue that light source will contain. Mixed white balance scenes have enormous creative potential for colour contrast. These scenes are impossible to get ‘right’ in the sense of making everything colour-neutral. And this is exactly their beauty. It’s up to you do decide what colour temperature to choose as your standard and what balance you wish to strike between ‘cold’ and ‘warm’ light.